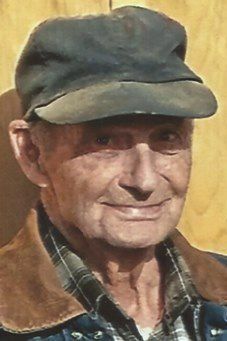 LA FARGE — Ervin D. Gudgeon, 90, of La Farge, passed away Thursday, April 4, 2019, surrounded by family. Ervin was born July 27, 1928, to Oscar and Bernice (Richard) Gudgeon in town of Webster and spent most of his life in Vernon County. He attended Star Valley School. On July 12, 1945, he married the love of his life, Vera O. Wilson. Together they had nine children. Over the years they made homes in Cashton, Viroqua and La Farge, most recently he had been living at Norseland Nursing Home in Westby. Sadly Ervin and his family lost their mother when he was only 10 years old. He started working when he was 14 years old, falling for a sweet young thing that lived up on County Trunk D, 4-miles out of Cashton, and he would ride his bicycle from La Farge to Cashton, so he could work for her parents. While Ervin had many jobs to support his wife and family during his life, he is probably most remembered for farming or in the latest years as being a craftsman building picnic tables, outhouses, doghouses, etc. His running the “Hobby-Shop” in La Farge kept him going, especially after loosing the love of his life. Ervin is survived his children, Donna Buckmaster of Westby, Kenneth (Char) of Oregon, Dale (Jolene) of Viroqua, Douglas (Pam) of Onalaska, Arnold (Cindy) of Granton, Betty (Ed) Lind, Erma (Tim) Erickson, Carl (Sherry), Linda (Mark) Baker, all of Viroqua; and his 26 grandchildren; 40 great-grandchildren; and five great-great-grandchildren. Also surviving are his brothers, Jim (Marla), Lee (Donna) of La Farge; and sisters-in-law, Geri and Betty. Ervin was preceded in death by his wife, Vera in 2003;, his mother, Bernice, in 1938; and his father, Oscar, in 1979. Also preceding him are an infant sister, Erma; his brothers, Harold, Richard, Eldon and Lyle; his sister, Esther Strait; his son-in-law, LaVonne Buckmaster; his granddaughter, Rhonda Buckmaster and two infant grandchildren; and two infant great-grandchildren. Funeral services for Ervin will beat 11 a.m. Wednesday, April 10, at the La Farge Free Methodist Church on Cherry Street in La Farge. Pastor Mark Phillips will officiate with burial in “Home Cemetery” rural Ontario, after a luncheon in La Farge. Friends may call during a visitation from 5 to 7 p.m. Tuesday, April 9, or one hour from 10 to 11 a.m. Wednesday, before the service at the church. In lieu of flowers or plants, memorials directed to the charity of the donor’s choice in Ervin’s name is deeply appreciated. To view the entire obituary or leave on-line condolences go to www.vossfh.com. The Vosseteig Funeral Home, 203 N. State St. in La Farge, is serving the family. 608-625-4244.